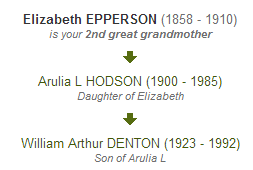 While working on my paternal side today, I noticed a bunch of wiggling leaves when I was adding a few items to the profile of my 2nd Great Grandmother, Elizabeth (Epperson) Hodson. I was pleasantly surprised that a fellow Hodson family researcher had uploaded a copy of her obituary on the front page of the Joplin Daily Globe, which was published 4 Sep 1910. Elizabeth was born 5 Apr 1858 to James Hamilton and Nancy Jane (Pyle) Epperson in Cedar County, Missouri. Elizabeth married John Benjamin Franklin Hodson on 15 Aug 1886 in Joplin, Jasper, Missouri. She was divorced from her first husband, James Cobb, with whom she had four children with. John and Elizabeth would add another four children to their family during their marriage of 24 years. Since it was a bit hard to read, I have transcribed the obituary the best I could. I believe a word or two had been omitted in the 7th paragraph when it was printed. My Great Grandmother, Arulia Hodson (who I refer to as my doppleganger) is listed as "Ruhler" in the article. bled to death in less than five minutes. and had never before had hemorrhages. from pulmonary apoplexy was rendered. just west of the Ino Mine. began to cough up blood. ran to tell the neighbors. her head up to stop the flow of blood. man’s arms Mrs. Hodson died. of the Huribut Undertaking Company. who is 13 years old. ment will be in Fairview cemetery. Just found your blog. I am a Pyle and wonder if you have researched your Pyle line. See Surname Saturday-Pyle of Chester, PA at my blog: From Maine to Kentucky to see mine.